This post is to further share angst that I feel, to find and lend support to those who may be considering the same things. Every little thing when it comes to a baby is so scary for the first time – food included. 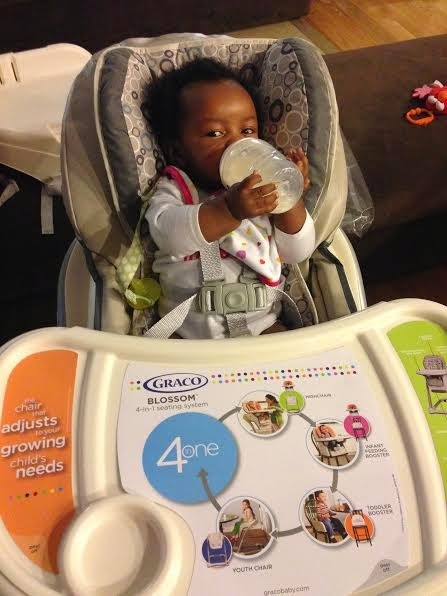 My daughter at 4 months immediately figured out how to hold her own bottle. I never had to teach her where to put her hands. One day I was rushing to get her settled and laid her in her boppy with the bottle at her lap. I went to take my shoes off and come back – this chick managed to get the bottle in her mouth and hold it there without my help! SCORE! Go Gracie! That has been a major relief because now feedings really just consist of getting her the bottle so she can feed herself. And this girl definitely recognizes her bottle. The only time she cries is for that bottle and has a spastic fit when its in sight and she can’t get to it. Its way too cute to see that sweet relief face that immediately is without a whine (because there are never real tears) when she gets that bottle. So now, we have introduce food. The regular 6oz aren’t just cutting it anymore and her hands are in her mouth more than ever thanks to those teeth that won’t be here any time soon. Thankfully, we didn’t have to rush out to get a high chair. It was given to us during one of our baby showers and I am forever grateful. We registered for the Graco Blossom 4 in One. It grows from Baby to a Toddler seat and also comes with an additional booster seat for when its time for her to sit at the table with the rest of us. After reading some tips on some websites, particularly from the company who’s foods we were trying (Gerber and Plum Organics) it said the best way to introduce food was to give her a small bottle first, introduce the food and the close with the rest of the bottle. So that’s what I did… I think she sensed that something was up. 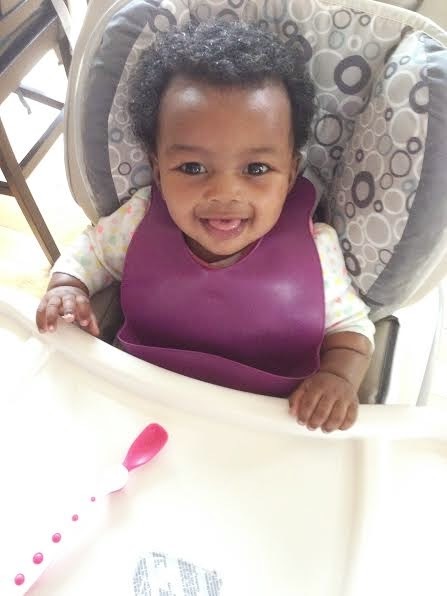 For her first feeding, I went with the Rice Cereal and mixed it with her Formula to a really watery consistency since that’s what Gerber recommends and tried serving it with a spoon. Well the spoon didn’t work out so great – because she didn’t understand the concept of opening wide for the spoon. She wanted to lap the liquid off the spoon like a little cat. So that little experiment was over quite soon. The mixture went back and forth from the bottle to the bowl just so she could see that mommy was serving her the same thing and that the spoon equals food just like her bottle does. Of course, you are supposed to wait about three days before introducing another food so that you can look for adverse reactions and have a clear idea as to what it could be. 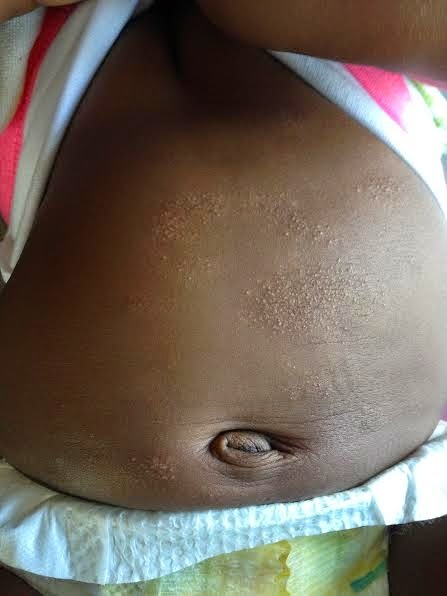 Well Gracia has eczema and has always had it on other parts of her body but never so pronounced on her stomach. They say it comes from the fact that I have seasonal allergies because neither one of us had eczema. Thinking this was a reaction to rice, I decided that no more for a while and gave her an Epsom salt bath with her eczema lotion. However, it wasn’t noticed until a day later and I realized it was not a food reaction but environmental and carried on. I asked a mommy friend of mines, when did she start introducing foods and what was her first food choice. She told me that actually she had started at month 4 and did Oatmeal and Applesauce mixed together with a slightly thicker consistency. So the next day, I went looking in my fridge thinking we had applesauce but we didn’t. But we did have Bananas. 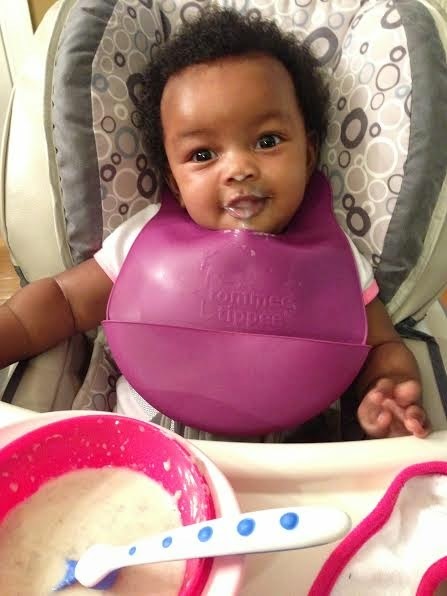 I mixed a small piece of banana with the slightly thicker one grain baby oatmeal from Gerber and tried that. Needless to say that went much better than the Rice Cereal. She even smiled as she ate it instead of the weird, “what IS this?” face she had been giving me. So I stuck with that … until my bananas went bad on me. So now, I figured I could try the food that I spent money on. Her daycare provider suggested that I start with vegetables because once babies get on those sweeter fruits, they may not like the veggies so much. I went to the store and decided Peas and Squash would be the way to go. It was two vegetables that if she actually liked, I also had frozen in my freezer and could make for her down the line. I got her set up in her seat. A lot easier then before – no bottle needed. 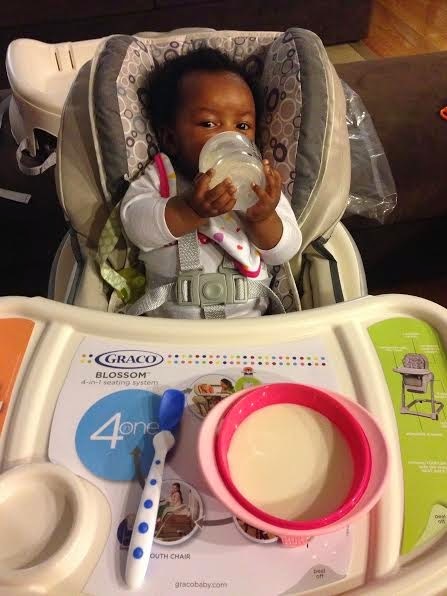 We are getting the hang of it… She gets her bottle feedings and in between only at dinner time does she get real food at this time. We tried the Squash first. She ate half the container, which is success seeing as though it was her first time and no reactions to it either. I am one happy mommy! She is one happy baby! I must admit this was one of my favorite stages! I loved trying out new foods with Emma. We found out early on what she likes and doesn't like…like she was very funny acting with apples and applesauce and she is still the same way today! Its crazy how being so little if they dont like it they aren't eating it! I love talking to other moms especially if you have some good sources…its amazing how you can be in the same stage as another family and you all bounce ideas off each other. Oh and the new mommy feelings stick with you for a while because I still question stuff with Emma and she's 2!!! Dont feel bad…I often remind myself if my husband and I agree thats all that matters! LOL!